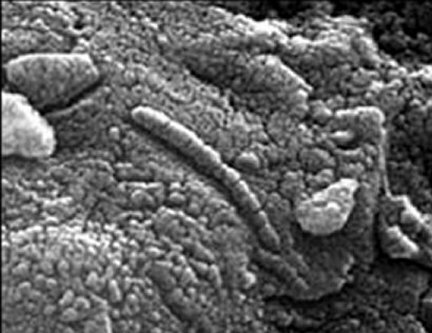 Martian fossils in the ALH84001 Antarctic meteorite? Today is TEDxDelft in the TU Delft Aula congress center. A great opportunity to be inspired with Ideas Worth Sharing. On stage will be two performers who have a Space connection, one more obvious than the other. The less obvious one is my own TNO colleague Guus Roeselers. Next to being awarded professional of the year 2012 he is also expert on system biology. His performance at TEDxDelft will be about the amazing cosmos of microbiology. The second performance is from Mars One CEO Bas Lansdorp. Mars One is a company that aims to bring human life on a one way trip to the red planet in 2023. The question that has kept Earthly scientists awake at night, for as long as life is conscious on our planet, is whether there is already life on Mars. It is clear that the only way that life could be present on Mars today is microbial life in the subsurface. Without an ozone layer and a thick protecting atmosphere, life could not exist in some sort of big animal or plant shape on the surface. I just met Guus outside of the TEDxDelft bloggers room and he reminded me of the Labyrinth documentary on Life on Mars that he was involved in two years ago. See the full version here!